The Cavendish apartment is ideally positioned for Eastbourne holidays – this 4*, gold-rated short term let is on the hall floor of a Victorian villa in central Eastbourne. Stylishly decorated and basking in natural light, it is just a few minutes stroll from the beach and moments from the cosmopolitan cafes, restaurants, Eastbourne theatres, Towner Art Gallery, Devonshire Park Tennis and town centre. The contemporary, open-plan lounge, diner and kitchen is stylishly appointed for both comfort and practicality. The lounge has a 32″ flat-screen satellite TV with DVD, an iPod docking station, and the holiday apartment includes free WiFi. There is a modern, fully equipped kitchen including a dishwasher and washing machine. This self catering Eastbourne holiday flat has a double bedroom, plus a larger twin bedroom with space for a camp bed or travel cot (we can provide – supplement applies for camp bed/bedding). The bathroom with underfloor heating and jacuzzi bath with shower over offers an opportunity for indulgence and escape while on Eastbourne holidays. All linen and towels are included in this Eastbourne short let, but please bring your own towels for the beach or swimming. For stays longer than a week, an additional set of linen and towels will be provided, as with all our Eastbourne holiday rentals. It is just a five minute walk to Eastbourne train station, with all the main attractions also within an easy stroll meaning that this makes an excellent choice for those without a car. If you do drive, parking permits are provided allowing you to park in restricted spaces directly outside and across a large part of the town centre. Ideal location, apartment delightful..... I can certainly highly recommend this lovely apartment. The way a holiday should be - Angela thought of everything! What an easy stay - she even left out some toys for my daughter to use during our stay (who squealed when she saw them! ), and made up a toddler bed that looked so cozy & inviting. Wonderful from beginning to end. Anyone that's traveled with little ones knows how trying it can be, so we were pleasantly surprised at how easy our stay was. Angela, the homeowner, thought of everything - from setting up a cozy cot for our daughter to having toys waiting for her when we arrived at Cavendish (she squealed when she saw them!). She also had a binder complete with information we needed to know about the apartment & area highlights, which made our stay that much easier - no endless searches for restaurants or nearby attractions. Also the location can't be beat, just about 2 blocks from the seafront. Also, she included milk & juice in the fridge to get us started, as well as some other tasty goodies - very much appreciated after a long flight. 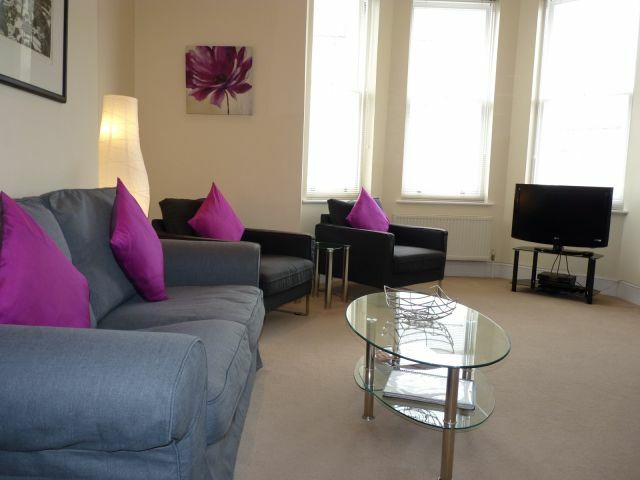 Ideally located within a few minutes walk of excellent theatres, shopping centre, station and beach. The apartment was spacious and clean with very comfortable beds. A large bathroom with jacuzzi bath and shower. Towels for the beach also provided. Everything one could possible need in the kitchen. I can certainly highly recommend this lovely apartment. A++ Accommodation. Our family stayed for a week in Cavendish apartment and we felt like being home right from the first day. I mean the apartment had all the amenities a family with children needs, to the last detail. We were really impressed. Special thanks to Angela, the owner, for being so kind and helpful. We stay in Eastbourne often visiting friends. This is the most well appointed / decorated apartment we have stayed at so far. We paid the £1 a day for parking and got a space right outside the door each day ideal when travelling with baby & pram etc. Owner was very welcoming and waited up to show us around despite arriving at midnight. Perfect location. The booking through Exclusively Eastbourne went smoothly and call was made by Sarah the same day to return the security deposit. Only thing I dont think was mentioned it is does have a 3 steps up to living room / kitchen area (see photo of corridor), not a problem for us but could be for disabled person. Twin room very generous on size had 2 twin beds and also our travel cot in and still lots of room. Double room smaller size but does its job. I hope the owner keeps up the maintenance on this property and it remains at its current standard. See full Terms and Conditions for more information and cancellation policy.